As of late, there has been a fresh strain of relations between Iran on one side and the U.S. and NATO on the other. But it is Iran's increasing influence on the Bab el Mandeb waterway – not its nuclear program – that has caused a fresh diplomatic and military stress. The strain has been created due to the recent abandonment of the Hanish Islands by Yemeni forces as the Houthis continue to consolidate their advance after they took over Yemen's Hudaydah port. A Djiboutian marine source told The Anadolu Agency on Monday that the loss of the Hanish Islands to the Houthis militants would diminish Yemen's influence. According to the source, this has become a cause of concern for an international coalition against piracy and contraband. The Hanish Islands dominate the strategic Bab al-Mandeb straight between the Arabian Peninsula and the Horn of Africa, one of the world's busiest waterways. Yemen's loss of the islands serves to facilitate smuggling into and out of the Arab world, although the anti-piracy coalition has for the most part managed to deter piracy in the region. Another source who insisted on anonymity said: "The security gap in the Red Sea is largely caused by Yemen's weakening military institutions as a result of the considerable inroads made by the Houthis." 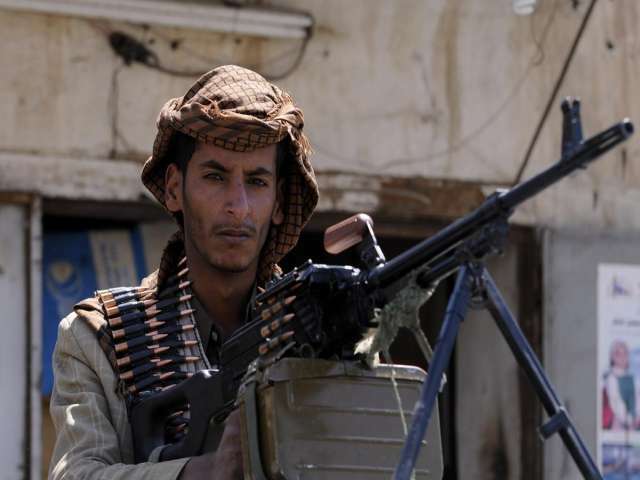 The militant Shiite Houthi group currently controls vast swathes of Yemeni territory, including most of capital Sanaa and the port city of Al-Hudaydah. But given the Houthis' lack of air and sea power, the situation, the source said, had created a conducive atmosphere for Al-Shaabab, Al-Qaeda and other militant organizations operating in the region. A diplomatic source said: "Eritrea and Yemen have restored diplomatic relations suspended since the 1995 war." Their relations were suspended due to claims and counterclaims on the strategic Hanish Islands, which Eritrea invaded. The resumption of diplomatic relations was reflected by the recent visit of a Yemeni ambassador to Eritrea, with whose leader, Isaias Afeworki, he held closed-door talks. According to the diplomatic source, Eritrea gave Yemen assurances that it would respect the decision of an international arbitration panel that awarded the islands to Yemen in 1998. But the visit also shed light on Eritrea's increased significance. It came at a time when Yemen faces its own internal political problems. The hopes of Yemen's government remain alive because the Houthis have not captured the entire country: Yemen's marine and air forces remain under the command of the government led by Abd Rabbuh Mansour Hadi. On another front, Eritrea has been in contact with the Houthis, which has brought Eritrea closer to Shiite Iran, which supports the Shiite Houthi group. According to sources, Houthis injured in frequent clashes with their local opponents are receiving medical treatment in Eritrea. These allegations have been corroborated by Eritrean opposition groups operating in Ethiopia. In addition to this, there have been reports of Iranian marine forces at Eritrea's port of Assab on the Red Sea coast. Such activities have led many Arab countries to follow the situation closely. The current situation has given Eritrea the opportunity to play a leading role. Political pundits say Eritrea is the major beneficiary from this, while the latter does not deny that it has maintained good relations with Iran recently. Meanwhile, the Houthis' capture of the Hudaydah Islands comes as good news for Iran, which has always wanted to expand Shiite influence in the region. But this could bring Iran into direct conflict with Saudi Arabia. Saudi's former head of security, Amir Sukri al-Faisal, has condemned Eritrea for this. He claims that Eritrea had earlier lent its support to both Iran and Israel by allowing the two countries to use its ports. The allegation, however, was denied at the time by Eritrean government spokesman Yemane Gebremeskel, who said neither Israel nor Iran had access to any of Eritrea's military bases in the Red Sea. Eritrean Foreign Minister Usman Saleh also reassured the Yemeni ambassador that Eritrea would support Yemen with a view to forging a durable peace in the fractious country. Some diplomatic sources approached by AA said Iran's scramble for influence in the Horn of Africa was intended to offset Western-imposed sanctions. According to diplomatic sources, Houthi control of Hudaydah would bolster Iran's regional influence. Iran's Red Sea policy, according to the sources, is geared towards bolstering its influence in international sea lanes. Currently, Iran has influence in the Strait of Hormuz and seeks indirect influence along the Red Sea via Eritrea and Yemen. Eritrea, meanwhile, has long felt isolated from the international arena and now wants a new power alignment in the region. It should be remembered that the Hanish Islands had been the primary cause of the bloody 1995 war between Yemen and Eritrea. Later, in 1998, an international arbitration committee awarded the islands to Yemen. In 1962, when Eritrea was still part of Ethiopia, Yemen had demanded that its boundaries with Ethiopia be demarcated. Then, the islands were given to both claimants. While Yemen had expected the boundary demarcation to be implemented as demanded, Ethiopia entered into war with Somalia, thus delaying the demarcation issue. Arab states, for their part, supported Eritrea's wish to secede from Ethiopia. Upon the secession of Eritrea, Yemen once again requested that the boundaries be demarcated. Eritrea, however, delayed the move until the issue led to armed conflict in 1995. The Hanish Archipelago includes three main islands: Jebel Seqer, Hanish al-Kubra and Hanish al-Sughra. Together they form the Hanish Islands, a strategic area that dominates the Red Sea's Bab al-Mandeb. Senior figures, including Trump, suggested that some kind of joint statement on the need to jointly re-examine commercial relationships might be found before their summit ends on Saturday. Zeid asked the UN Human Rights Council to set up its highest-level probe -- a Commission of Inquiry -- for Venezuela and said the International Criminal Court may need to get further involved. The US plans to ban firms with at least a quarter Chinese ownership from buying US companies with “industrially significant technology,” the Wall Street Journal reported, as a trade war between Washington and Beijing intensifies. Erdogan won another five years in office in Sunday's vote and immediately pledged to implement changes that boost his authority, which opponents fear will give him autocratic powers. American Muslim opinion leaders said Erdogan's success meant a lot for the Muslims living around the globe.